Need something different from a salad? Grill it. 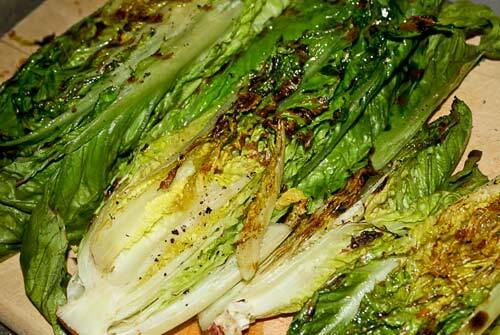 The high heat intensifies the sweet flavor of romaine lettuce leaves. Radicchio and Endive leaves will also work well in this recipe. This salad is very easy to double and is a big crowd pleaser! Brush lettuce and onions with oil, salt and pepper. Place lettuce on the grill and quickly sear both sides making those distinctive grill marks. Remove and set aside. Place the onions on the grill and cook for approximately 2-3 minutes per side. Just until desired doneness. To assemble salads, place 1 romaine heart on a plate, 2 or 3 onion slices, 1 tbsp cheese and splash of vinegar. This entry was posted in Metabolic Medical Center Recipes, Modified Profast (Fast and Flexible) Recipes, Nutriplus Recipes (Balance Your Pyramid), Party & Entertaining, Salad, Vegetables and tagged balsamic, fast, grilled, healthy, lettuce, metabolic diet recipes, onion, red onion, romaine lettuce by foodies4mmc. Bookmark the permalink.